Body mass, fat mass, caloric intake, and glucose tolerance of leptin-deficient ob/ob mice following VSG. Generalized protocol and group description (A), body mass (B and D), fat mass (C), cumulative caloric intake (E), glucose tolerance in response to a mixed-meal oral gavage (oGTT, F), and corresponding area under the curve (AUC, F insert) for chow-fed ob/ob mice receiving sham surgery (Sham Control, n = 11, light blue lines/bars), daily leptin treatment (Leptin, n = 10, orange lines/bars), pair-feeding yoked to leptin group (Pair-fed, n = 11, dotted orange lines/bars), or vertical sleeve gastrectomy surgery (VSG, n = 6, light green lines/bars). *P < 0.05, **P < 0.01, ****P < 0.0001 versus all other groups at the same time point. †P < 0.05, ††P < 0.01 Leptin versus Sham Control and Pair-fed. ##P < 0.01 VSG versus Sham Control and Pair-fed. 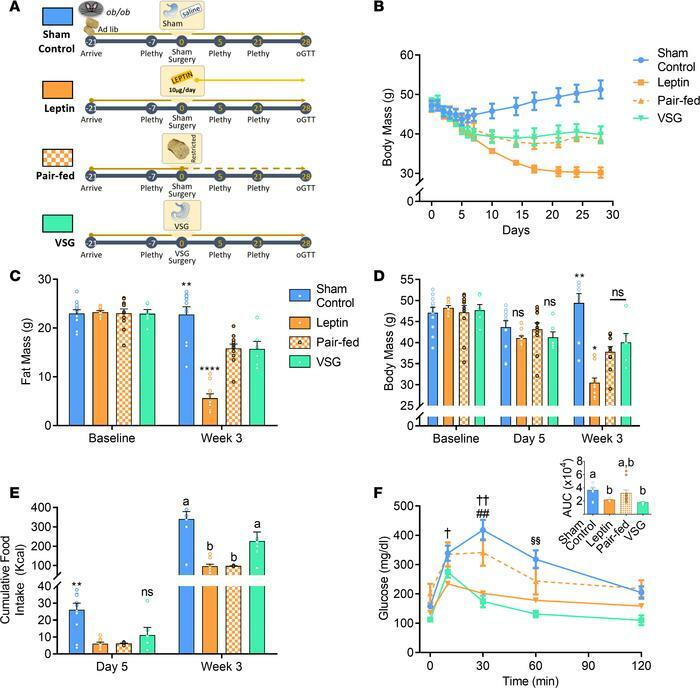 §§P < 0.01 Sham Control versus Leptin and VSG. Different letters indicate significant differences (P < 0.05) between groups. P values indicate Tukey’s post hoc comparisons from repeated-measures ANOVA or 1-way ANOVA. Data expressed as mean ± SEM. Plethy, plethysmograph.